Reduce with a Zero Waste Event! A Zero Waste Event is defined as any one-time program, occasion, or event that reduces waste by diverting 90% or more material from landfills through recycling and composting. Composting at an event is a great way to show you’re serious about sustainability! 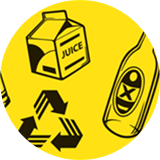 It’s also a great opportunity to teach your guests the important of source separation of organics and recycling, and allow them to engage in the process. 20 color-coded waste bins for Compost, Recycling, and Trash with wheeled transporter. Signage customized to the foods and brands served at your event. 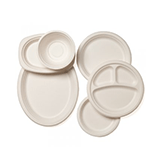 Finding sustainable service-ware and materials for your staff and guests. 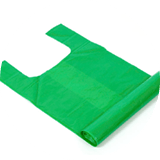 Providing liner bags specific to each category of waste. 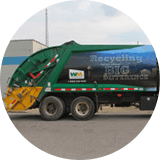 Coordinating and contracting a waste hauler to remove the various streams of recycling and trash. 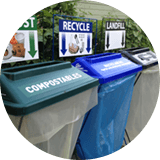 At Common Ground, we appreciate as little landfill waste as possible, if you need assistant with recycling services at a large gathering – just let us know!